Signature Twill Shirt with structured stripes that lends a vibrant, three-dimensional effect to your look. 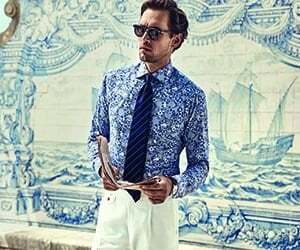 Details such as the floral fabric inside the cuffs and collar and the navy buttons and button thread make add an interesting touch to this design. Wear it with a navy suit for a timeless and elegant business look.